What a joyful day we had yesterday! First thing in the morning, Martin was off to buy cement. There is a man, Meshach is his name. He is the father of three sons, including Erik, who came to the US with John to go to IYOU this past summer. Erik is seventeen, and wants to go to university and become an accountant. His father was severely crippled in a car accident sixteen years ago, and can walk only with the aid of a crutch and a cane, and has very limited use of his hands. The stoop before. Also note the tininess of this house. You can’t tell from the picture, but this house is only about ten feet deep. I can’t get used to how small so many of the houses are here. This photo is a picture of the house that Erik and Meshach live in. It is tiny. The stoop is broken and extremely uneven. Martin went with Erik to help Meshach a few days ago to get out of his house and he said it was a very long and slow ordeal. 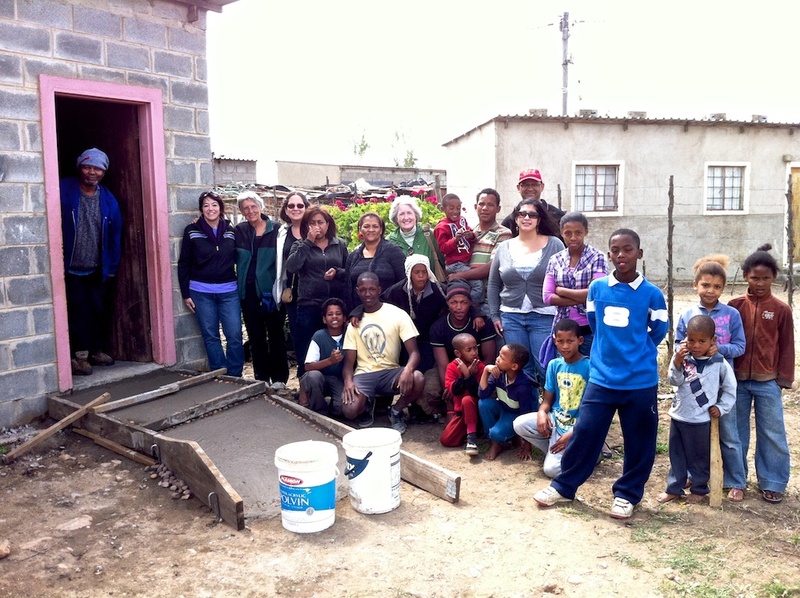 So, with the help of Lynn and Kim from the US, who kindly donated funds, we created this ramp for Meshack so that he can leave his house without assistance. This is huge, because it means that Erik can go off to university without worrying about his father. Here’s the completed ramp and all the loving people that were there to help. Meshach is in the doorway. Soon, once the ramp is dry, he’ll be able to get out of that house much more easily! Then, later that same day, Martin got all the computers up and running. Here are all the adults who do so much to help make the Riviersonderend Community Foundation go. Belinda, Martin, Robin, Lietie, Wiena, Joan, Maura, John, and me. 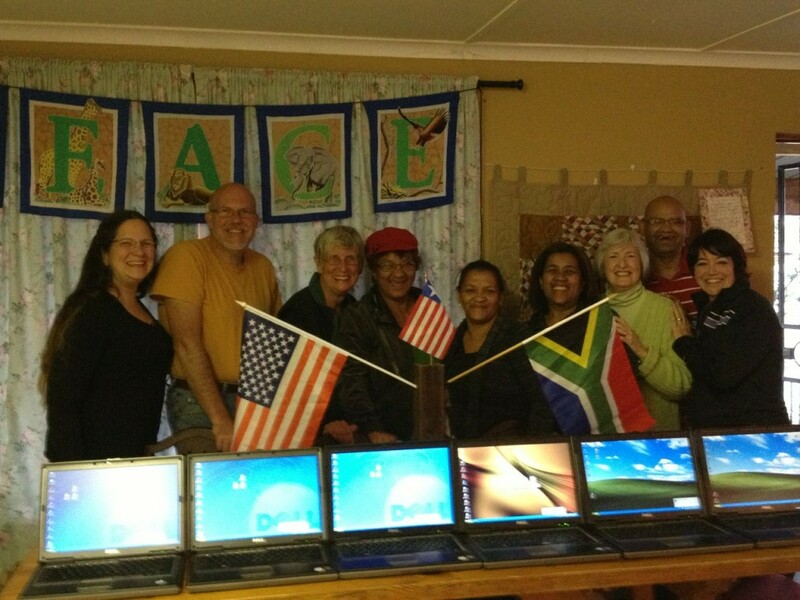 Readers of this blog, Kathy and Sandy, donated two and a half of these computers. These are the computers that will be connected to wi-fi and will be for the use of the children and the community as a whole to be able to access the Internet, and to use programs like Word and Powerpoint and Excel (the children do a bit of learning on these programs in school, but get very little if any time to practice their skills). 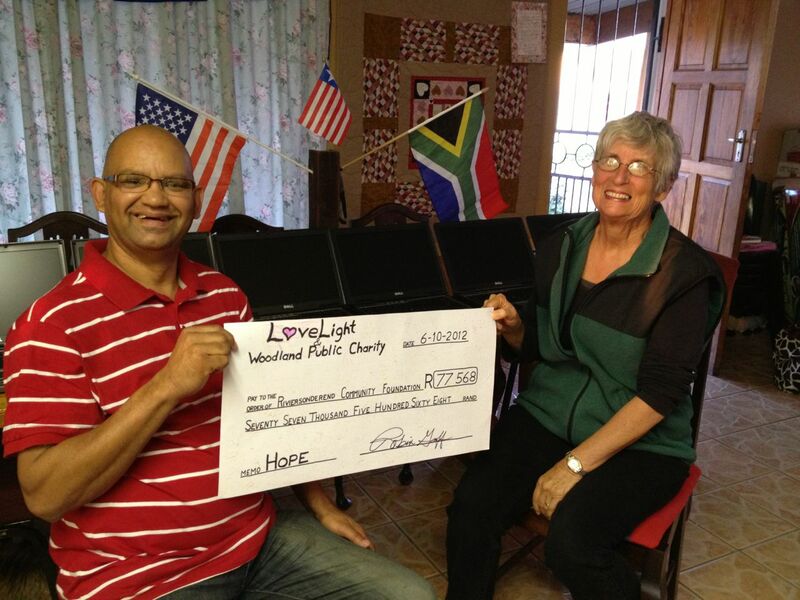 Lastly, we got to witness as Robin presented a check from the Woodland Public Charity for the funding for the Riviersonderend Community Foundation for all the work they do for the whole year. Seventy-seven thousand rand sounds like a lot, but it’s less than 10,000 US. This will fund the Internet connection for the computers, supplies for the Internet center and a new building (one of those giant shipping containers, with a door and windows cut out) to hold the Internet center. So lots of love and service and gratitude and joy and peace and even more love is filling my heart today. How grateful I am that I get to be a part of all of this. 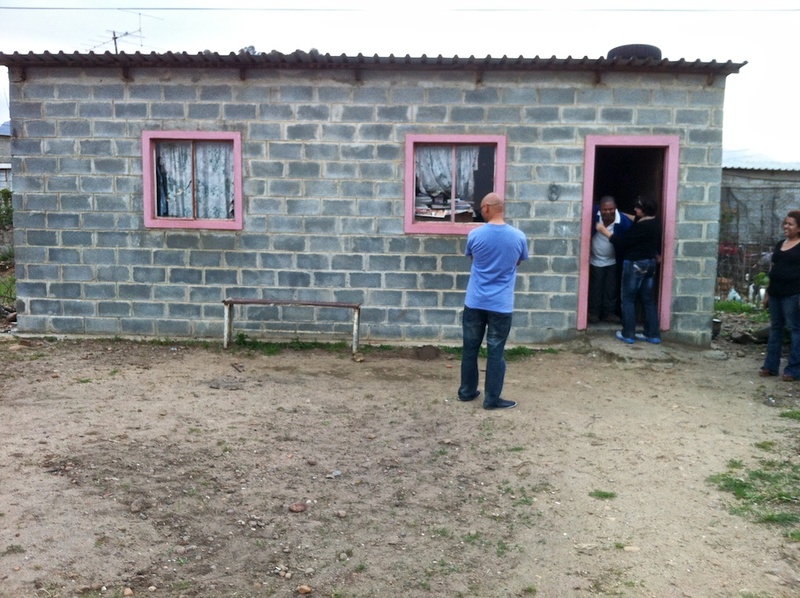 We have plans to allocate more funds to the feeding scheme at Blikkies after we get back to Cape Town. So you have an opportunity to be a part of this great work. You see that little donate button? That one right there? You can hit it and send a donation and we can get it into hands that are making food for children. Your money can go to feed a child (or a lot of children) right now. This is a perfect time to do this because it’s really hard to send money to South Africa, we kind of have to bring it. So instead of waiting for the next trip, won’t you do it now? This entry was posted in Connection, Giving back, Passion by Luna.Bookmark the permalink. 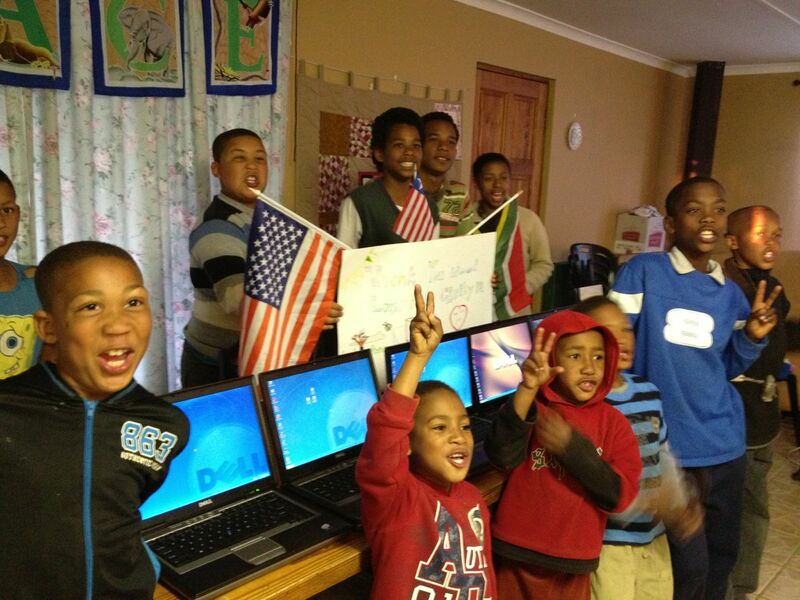 I must say this is so AWESOME!, to see the wonderful work you guys are doing in South Africa,for the Less Fortunate, May you all,always be blessed. This is a great aim and vision that we at Bread 4 Life(4 Change) would like to achieve this in time come to help our community at Symphony Way T.R.A. (Blikkiesdorp)Delft, Cape Town, South Africa. Hope to see you guys before leave for the US.